Computer desktops can get very cluttered with open windows. We have many programs open as we work with them. It’s not too far from the paper and note covered desktop before we had computers. But now we have a virtual cluttered mess AND a physical mess on our Desktops. 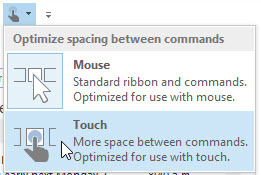 At least with our virtual desktop, we can perform the one-button-clean-up and turn off our monitor. Some people have very tidy desktops. Everything has its place and is in order. Other people work organically, letting their desktops overflow with paper and notes. Discussion: How does Computer/Virtual desktop clutter affect us? I’ve been using Outlook 2013 in minimalist mode for a month now, to see how differently I’d work and feel. Minimalist mode is when the Ribbon menu, buttons and folders are hidden from view. I have found minimalist mode to be a more focused and less claustrophobic experience. Why do we feel we need to see all the menus, buttons and folders constantly? Is it a subconscious comfort? With the Ribbon Menu, buttons and folders always visible it gives an individual a sense that they have complete command over their communications hub because they can see everything. I don’t miss the Start Menu button. I have often adjusted to and fro between having menus and panels hidden, including the Windows taskbar. The Start Menu button was simply hiding, tucked away in the corner, ready to reappear when I moved my mouse to it. Our desktops can get very cluttered. I don’t necessarily mean with icons. I may have three or four programs open at any one time during the day. Each might have two or three windows open. With all the white, text and colours visible in front of us, looking at the computer screen can feel like looking down a street full of advertising, billboards, hoardings and neon signs. There is a subconscious effect on our stress levels. We might be focused on the content of one window, but what we see peripherally can affect us. Web browsers have used tabbed browsing for a number of years now. That has greatly reduced the desktop clutter of open windows. 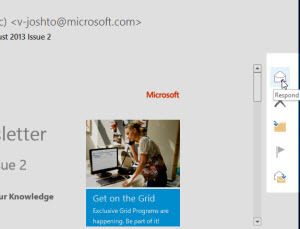 Outlook has used the reading pane even longer than tabbed browsing has been around. So when Outlook 2013 introduced in-line replies from the reading pane, that was another sweep of the broom, cleaning open window clutter. The next frontier is simplifying the user interface of an application, without making the functions and features difficult to get to. Is this why people are drawn to using tablets to perform light computing duties? Because their user interfaces are cleaner? I like what Microsoft have done with Outlook. By providing a few ways to hide the menus, buttons and folders, I can better focus on content. The Ribbon menu is still within easy reach, tabs are visible but buttons are hidden. Folders can be collapsed to the side, keeping a few favourite folders visible. The navigation menu for Mail, Calendar, People and Tasks is compact and by hovering over each of the buttons, I make use of the Peek view to see an agenda, look up a contact or view a task list. Plenty of blogs and articles have already talked about these new features. But what does it feel like to use them? What affect does it have on your focus when you set menus and folders to auto-hide? I don’t miss having buttons and folders constantly in view. I click on tabs and use them when I need them. 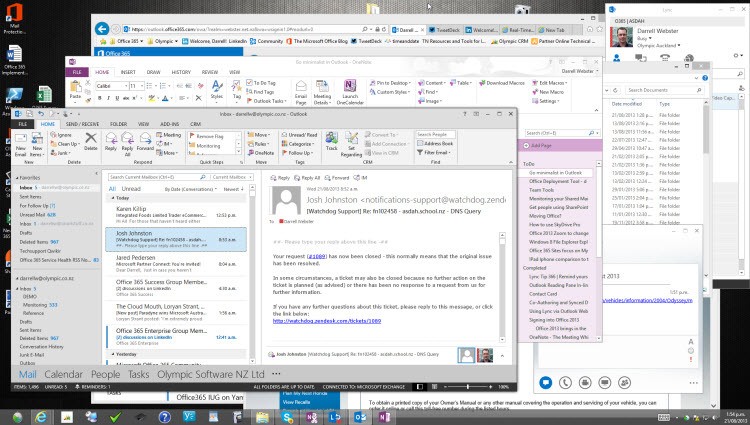 But for the most part, working with Outlook is a cleaner, less stressful experience. Using Outlook in this minimalist mode on a tablet is a great experience too. The folders, navigation and panels collapse to the left and right of the screen. I can comfortably use my thumbs to navigate and use buttons. To change to minimalist mode, we’re going to hide 4 things. 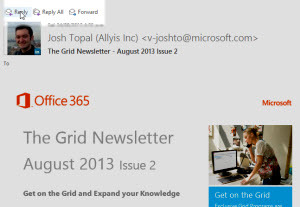 [Update 5 July 2014] After reviewing this blog post, I found an easy way to set Outlook to Minimalist Mode in TWO clicks. Don’t panic, it’s still there – auto-hiding. Inbox Rules – If you use Rules to manage your email, one action your rule may take is to direct new messages to other folders in your mailbox. 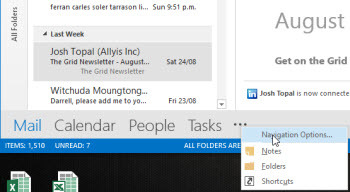 Consider what folders you would like to see in your Outlook minimalist view. Drag them into your Favourite folders. Depending on the size of your screen, your 3 or more of your Favourite folders will be displayed in your minimized Folders pane. Touch Mode – Buttons have additional space around them, to set a larger target for your digits to press them. Reply, Reply all and Forward are combined under a Respond button, on the right side of the screen. Other common functions Delete, Flag for Follow Up and Move to Folder are on the right side Touch menu too. I encourage you to try these adjustments for a few days. Even if you don’t use them all. If you can’t live without seeing all your folders, leave them visible. Adjust Outlook to suit how you work. Using Outlook 2013 in minimalist mode may not fit your working style. But it helps to de-clutter the desktop and put the focus on content, rather than buttons and folders with blue unread message counts. You did not convinced me. 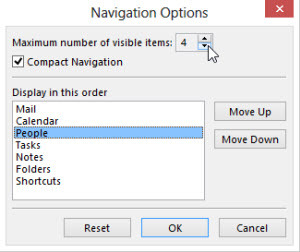 Previous Office interface with drop down menus and the small icon short-cut bar was FAR MORE EFFICIENT than all the new scap Microscrap designed in their new version. This is only justification to “resell” the license and make the impression the user is having a new product in hand. Let’s say … an email viewer is an email viewer, a text writer is a text writer, and all this code is amortized for so many years. Microscrap just want people to pay more for nothing more!